Are you looking for a flavorful cupcake with the delicious flavors of a classic cake? These German Sweet Chocolate Cupcakes are just that. Enjoy the flavors of German chocolate cake in cupcake form! Because cupcakes are ALWAYS fun! They are a delicious mix of light chocolate cake paired with an ooey-gooey coconut and pecan topping. If you’re like me, you’ll be hooked on them. The whole salty nutty caramel chocolate combination is just too good, you’ll definitely have to have more than one! Preheat oven to 350° F. Line two muffin pans with paper baking cups, then set aside. Break the chocolate bar into pieces. Melt over low heat and set aside to cool. In a large mixing bowl, sift together the flour, sugar, baking soda, baking powder and salt. Set aside. In a separate large mixing bowl, stir the butter or margarine to soften. Add the flour mixture, 3/4 C. of buttermilk and vanilla. Mix together just slightly to dampen the flour, beat for 2 minutes at medium speed. Add the melted chocolate, eggs and remaining buttermilk. Beat for 1 minute more, making sure everything is mixed well together. Scoop cake batter into each cupcake liner in the prepared pans. Bake at 350° F. for 20 minutes, or until toothpick inserted in center comes out clean. Remove from cupcake pan and cool on wire racks. In a medium saucepan, combine the evaporated milk, sugar, egg yolks, margarine or butter and vanilla. Cook over medium heat until mixture thickens, stirring occasionally, for about 12 minutes. Remove from heat and add chopped pecans and coconut. Set aside to cool to get to a good spreading consistency, mixing occasionally. Add the frosting to the cupcakes after they are completely cooled. October 3, 2018 April 3, 2019 Baking, Bloggers, Cake, Chocolate! German Chocolate Cake is a classic made-from-scratch cake. The delicious layers of moist, light chocolate cake are topped with a signature coconut-nut frosting. German Chocolate Cake takes me back to family dinners at my grandma’s house. She is always baking up yummy desserts! German Chocolate Cake is definitely a popular favorite at family occasions. The cake itself is moist, dense and a light chocolate flavor. It pairs wonderfully with the filling and frosting. The frosting is packed full of flavors!! Sweet with a creamy, milky texture, nutty with the tastes of coconut and pecans, and a sweet hint of vanilla. Grab a glass of milk or cup of coffee and enjoy a slice! Preheat oven to 350° F. Line bottoms of three 9-inch round pans with parchment paper, then set aside. Break the chocolate bar into pieces and melt over low heat, then set aside to cool. In a large mixing bowl, sift together the flour, sugar, baking soda, baking powder and salt. In a separate large mixing bowl, stir the butter to soften. Add the flour mixture, 3/4 C. of buttermilk and vanilla. Mix together just slightly to dampen the flour, beat for 2 minutes at medium speed. Add the melted chocolate, eggs and remaining buttermilk. Beat for 1 minute more, making sure to mix well together. Pour batter into prepared layer pans. Bake at 350° F. for 35 minutes, or when a toothpick inserted in center comes out clean. Remove cake layers and set aside to cool for 15 minutes. Remove from pans and cool the rest of the way on wire racks. In a medium saucepan, combine the evaporated milk, sugar, egg yolks, butter and vanilla. Cook over medium heat until mixture thickens, stirring occasionally, for about 12 minutes. Remove from heat and add chopped pecans and coconut. Set aside to cool to get to a good spreading consistency, mixing occasionally. When the cake layers are cooled completely, spread the frosting on top of each layer and stack together. September 5, 2018 April 3, 2019 Bloggers, Cake, Chocolate! 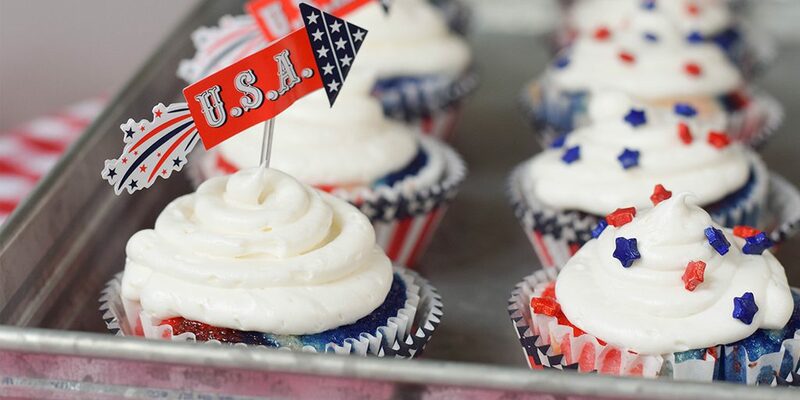 If you’re looking for patriotic cupcakes for your next party, these Red, White and Blue Cupcakes are a perfect treat! They’re a great addition to any Memorial Day or 4th of July celebrations. Summer brings many opportunities for get-togethers: cookouts, picnics, backyard BBQs and pot-lucks with celebrations of holidays, birthday parties, family reunions…the list goes on. My family has a 4th of July party/family reunion every year. Each family brings a side dish or dessert to share along with lots of burgers and hot dogs from the grill. There are games for the kids, corn hole, swimming, beer, lots of visiting with family and lots of food. At the end of the night we light our own fireworks. A fun all-American celebration. As we celebrate America’s birthday, a delicious addition of Red, White and Blue homemade cupcakes straight from the kitchen is always fitting. These yummy cupcakes are perfect for the dessert table at the get-togethers. These homemade cupcakes are super moist as well as fun red, white and blue colors to celebrate America! Preheat oven to 350° F. and prepare muffin pan with paper baking cups. Add the flour, sugar, baking powder and salt to a large mixing bowl or your stand mixer and mix together. Set aside. In another mixing bowl, add the milk, vegetable oil, vanilla extract and egg whites and mix together. Add the wet ingredients to the dry ingredients in the large mixing bowl and combine together until well mixed. Add the water to the batter and mix together on low speed until it is all well combined. Divide the batter equally into 3 separate bowls. Use the red and blue food coloring gel and color 2 of the bowls of batter, to have a red, white, and a blue batter. I used about 2 butter knife tips of food coloring, you can add more to or less for desired color. Spoon a little of each batter into your cupcake liners, filling about 1/2 way full. Bake at 350° F. for 17 to 20 minutes, or until toothpick comes out clean. Let the cupcakes cool for a few minutes, then remove them to a cooling rack to finish cooling. For the frosting, simply use a premade white frosting. Add the frosting to a piping bag. When the cupcakes are completely cool, pipe the frosting on top of the cupcakes. I used the round piping tip Wilton #12. Add sprinkles and other holiday decorations to cupcakes. What a fun way to enjoy dessert to celebrate America! These can easily be made for graduations by making the batter school colors. This is a classic butter pound cake and contains just 6 ingredients. It is the Davis Baking Powder version of the traditional “pound of butter, pound of sugar, pound of eggs, pound of flour” cake. Preheat oven to 325° F. Grease a 10-inch Bundt or Angel Food Cake pan, then set aside. Using a stand mixer fitted with the paddle attachment or a hand mixer and large bowl, cream butter and sugar until light and fluffy. Add eggs, one at a time, beating well after each egg. Add egg whites; beat well. Blend in vanilla. Gradually add flour, baking powder; mix until thoroughly blended. Pour into prepared pan. Bake at 325° F. for 1 hour and 10 minutes or until wooden toothpick inserted into center of cake comes out clean. Cool ten minutes. Remove from pan. Before serving, sprinkle with additional powdered sugar or powdered sugar glaze, if desired. Whisk powdered sugar with milk and vanilla. Add additional milk if needed to make the glaze a thin consistency for pouring over cooled cake. Preheat oven to 350° F. Line a jumbo 6-cup muffin pan with paper baking cups (or a standard 12-cup muffin pan). In a medium heatproof bowl, add the chocolate and cocoa powder. Pour the hot coffee over mixture and whisk mixture gently until smooth then set aside to cool. Let stand for 5 minutes. In a small bowl, whisk together the flour, sugar, salt and baking soda and set aside. Whisk sour cream, oil, eggs, vinegar and vanilla into the cooled chocolate mixture until smooth. Stir in the flour mixture until smooth. Divide the batter evenly among the prepared muffins pans. Bake until a toothpick inserted in the center comes out clean, about 20-25 minutes for the jumbo muffins or 14-18 minutes for regular size muffins. Let cool slightly and then remove from pans and let cool completely. Beat the butter until creamy and lightened in color. Add 1 cup of powdered sugar and beat to combine, continue adding the powdered sugar 1-2 cups at a time until the mixture is light and fluffy, and add in extract and mix to combine. Add in your raspberries and mix until raspberries have broken down and are fully incorporated into the mixture. If the mixture is too stiff mix in 2-3 tablespoons of milk to reach desired consistency. Add heavy cream to a small saucepan and bring to a boil stirring frequently. Put chocolate chips in a medium bowl and pour heavy cream over chips. Gently stir chocolate and cream together with a whisk until all of the chips are melted. Add butter and stir until all ingredients are fully combined and ganache is smooth and glossy. Use a spatula to transfer frosting into a piping bag or a plastic bag with the corner cut off. Pipe buttercream frosting onto completely cooled cupcakes. Drizzle with chocolate ganache. Need an easy recipe to bake and take? This Chocolate Loaf Cake recipe is great for that! I made it the other day for a snack carry in I attended and it went over well. Simply mix everything together, bake, cool, slice and you’re done! This cake is light, fluffy and moist! One slice of the loaf is perfect for like chocolate fix too! The Chocolate Loaf Cake recipe is on page 135 of the Rumford Complete Cookbook. Below is a copy of the recipe. In a large mixing bowl beat one cup of the sugar with the butter to bring to a cream. Add the eggs, 1/2 of milk and vanilla. Mix together well. Add the flour and baking powder to the mixture and beat them into the other ingredients. Set aside. In a small saucepan, add the remainder of the sugar and milk and the chocolate squares. Cook until chocolate is dissolved, stiring occassionally. Add the chocolate mixture to the cake batter and beat together well. Bake in a loaf pan at 350° F. for 1 hour. After cooling, you can also add your favorite frosting! Oh the flavors of lemon and blueberry together are just perfect together! If you have never tried them together this Lemon Blueberry Bundt Cake recipe is amazingly delicious recipe to enjoy! When I think of lemon and blueberry together I think of fresh flavors and the Spring/Summer season. Two very different flavors that come together perfectly. Bake it in the summer when fresh blueberries are in season! In Indiana, blueberries are in season the end of July/August. I have fun memories growing up going to the local blueberry patch and picking, and picking, and picking until we got a good amount to bring home for fresh blueberries and to put some up in the freezer. I have enjoyed taking my kids as well! The blueberries provide a nice moistness to the cake with bursts of flavor, while the lemon and lemon zest give a nice zingy, lemony flavor, but not over powering. An added hint of sweetness is in the light icing. Preheat oven to 350° F. In a mixing bowl, add the flour, baking powder, baking soda, and salt and mix until combined and set aside. In another bowl, beat together the butter and sugar until well blended. Add the eggs and use a hand mixer and blend in one at a time. Add the lemon juice, zest, vanilla, and milk and beat together until just combined together. Add the flour mixture to the wet ingredient mixture and mix together well with a hand mixer. Add the blueberries and gently fold them in with a rubber spatula until incorporated. Grease a large Bundt pan. Pour the prepared batter in the Bundt pan. Bake at 350° F. for 50 to 60 minutes or until toothpick comes out clean. Cool for 20 minutes and run a thin knife around the edges to loosen the cake. Cool turned over and cool completely, then remove from pan. For the icing, mix together all icing ingredients until smooth. Drizzle over cooled cake. It will seep into the cake. Not only is this cake delicious, but its also definitely looks stunningly delicious too! Perfect for carry-ins, family holidays, breakfast, brunch, or dessert. So many options to make this pleasant lemon blueberry Bundt cake. You can’t help but smile when enjoying this cake! Strawberry fans will love this homemade strawberry poke cake! White cake made from scratch with strawberry gelatin combined with bits of strawberries throughout the cake, a thin layer of strawberry chunks, topped off with a layer of whipped cream is sure a sweet delight! Add a final touch of sliced fresh strawberries to the top to complete this fresh dessert! Since Valentine’s Day is coming up I thought it would be fun to share such a pretty cake and perfect for the holiday. But it is also great really any time of the year, especially when fresh strawberries are in season! Strawberries are my favorite fresh fruit in the summer! It is a great summer dessert! This delicious white cake flavored with fresh strawberries and topped off with a layer of whipped cream is the perfect dessert for that fresh and sweet taste in a cake! It looks beautiful when you cut into it. If you need a fun, festive and tasty dessert for any holiday or get together this is a perfect and simple treat to make. I like to bake desserts homemade and that is what I share here in the recipe, but you can easily use a White boxed caked mix just the same. In a small mixing bowl combine the flour, baking powder, baking soda, and salt. Mix together and set aside. In a large mixing bowl combine the shortening, sugar, and vanilla and beat together with hand mixer until well mixed. Add egg whites to the sugar/shortening mixture and beat well. Then add the flour mixture and buttermilk a slowly and continue beating together until it is all mixed together well. Pour the batter into a 9×13 well greased baking pan and bake at 350 degrees for 30 minutes. Remove from the oven and let cool. While the cake is baking and cooling, prepare the strawberry topping. Boil the water in a small saucepan. Chop and dice the strawberries into small pieces and crush them slightly. 2 cups of strawberries are needed. Add strawberry gelatin mix, the boiling water and the crushed strawberries to the saucepan and bring to a boil, then let cool. Once the cake is cool use the end of a wooden spoon with a round handle and poke holes into the cake. Pour the cooled strawberry gelatin mixture over top of the cake and into the holes. Some of the strawberries can be spread out on top of the cake as well to give a little strawberry layer on top of the vanilla cake. Top off the cake by spreading the whipped cream all over the cake and add sliced strawberries on top. Keep in the refrigerator until ready to serve. These little sugar cakes are so simple and tasty! I talked a little bit before about liking to make snacks for my kiddos to enjoy. When looking through the Rumford Complete Cookbook this month, I had snacks in mind for a recipe to try! These little cake muffins are delicious sweet treat! They are soft, moist and fluffy but yet pleasantly dense. Packed with a sweet flavor they are kid approved….my son loved these! The Sugar Cakes recipe is on page 163 of the Rumford Complete Cookbook. Below is a photo of the recipe. Here is my version of the recipe with some updates. Mix together the butter and the flour in a medium mixing bowl until crumbly. Add the sugar and mix well. Beat the egg whites until slightly frothy and add them to the dry mixture. Mix together well with a hand mixer. Pour mixture into a well greased mini muffin pan for small cakes. Sprinkle a small amount of sugar onto the top of each cake. Bake at 350 degrees for 15 minutes or until golden brown. The mixture was too runny with this recipe from the cookbook to roll out at all on a cutting board and cut into small cakes. I decided to bake them in the mini muffin pan and they turned out great! Mini cakes! The recipe makes 18 mini sugar cakes. A moist, sweet in flavor little mini cake. Grab a handful for a little snack!